I recently decided to start another hand sewn quilt. I like having something to do while I watch a movie, sit on the train or listen to the radio so I couldn’t resist a new project when I saw this quilt-along. I used her instructions and made a lot of modifications, but I really liked the idea of preparing the pieces with fusible. I chose to cut out the pieces on Steam-A-Seam and iron the edges down to hold them in place instead of using glue. I spent a few weeks cutting out and ironing the pieces. The biggest challenge for me was getting accurate points, especially with thicker fabric. 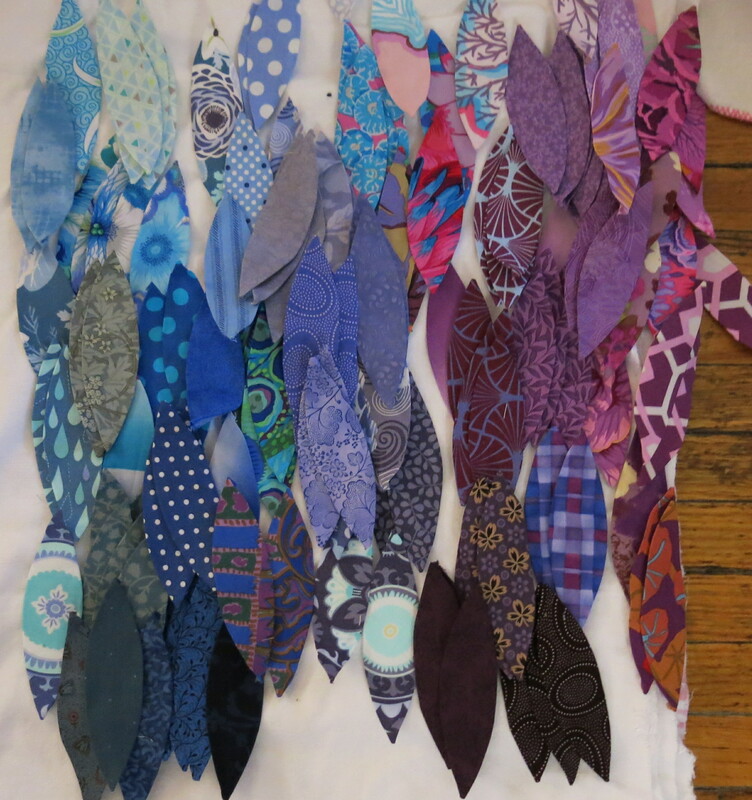 I wanted a rainbow effect, so I sorted the pieces out by colour, then laid them out in the pattern. 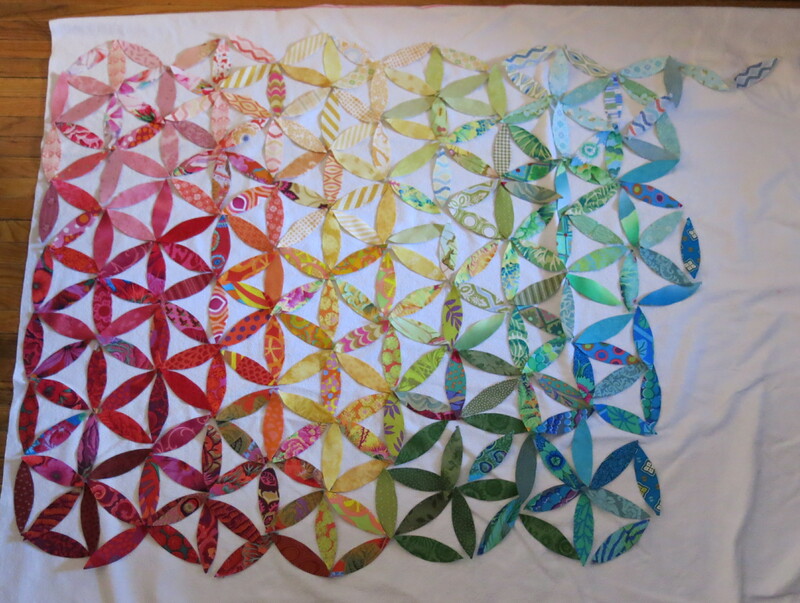 My plan is to applique the whole quilt with pearl cotton, and then use the thread to blend the colours during quilting. 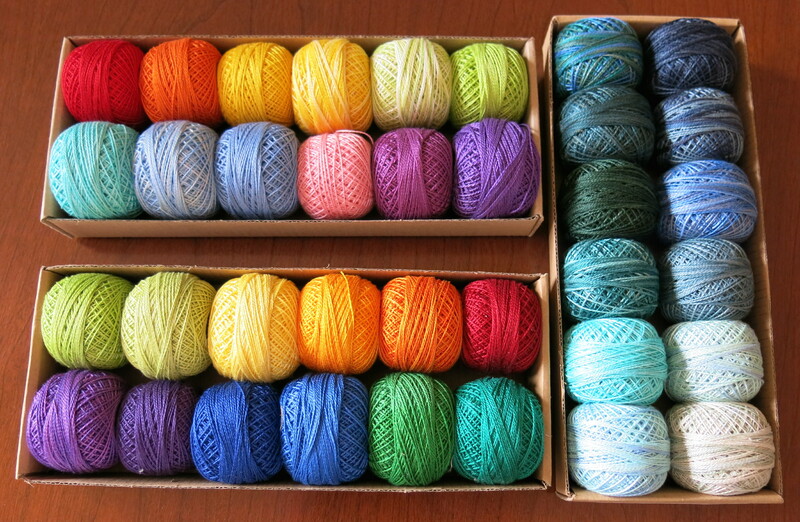 I ordered some wonderful thread from Valdani (size 12). 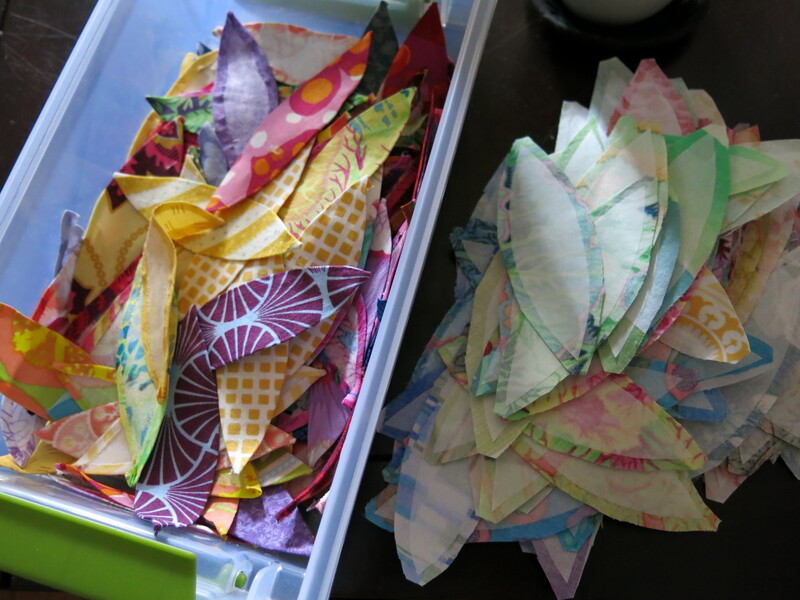 I love the bright colours and I can’t wait to show my progress as I work on the applique! It will be gorgeous. I just love the way the colours wash into each other. Thanks! I love bright colours. Most of the quilts I did before were a bit more muted, but I’m starting to play around with new ideas now. Wow, what a labour of love. This one is going to be gorgeous! I hope so! I’m hoping to play around with the stitching to add more texture and dimension to it. Stay tuned! Hi. This pattern is on my to-do list (or something like that). I’m still debating on how am I gonna appliqué it: raw edge, zigzag, blanket stich (all by machine), color or invisible thread…. I’ll follow your progress, your colors are wonderful. Thanks! I like having something to do that’s portable, so that’s one of the reasons I chose to do it by hand. I also fell in love with that thread and wanted an excuse to try it out!